Originator; Alfred Chandler, Vauxhall, England. Seed planted in 1823. Elegans has been, and continues to be, widely grown throughout the world. Like most old cultivars, it has received many renamings, but its identity has never been in question. Dr Kishikawa’s illustration captures the correct colour better than many published photographs. As noted in the Register entry, Elegans has produced a remarkable number of sports, some of which have in turn produced further sports. The lineage of Elegans → C.M. Wilson → Hawaii → Kona → Kona Benten is unique in camellia literature. In addition to the sporting propensity, it is possible that strains have developed, plants of which will have larger or smaller flowers, while retaining the other original characteristics.. Also common today are strains which show varying amounts of vegetative white (a separate condition from virus-induced variegation) among the central petaloids – not as attractive as the original solid coloured flower. This variable amount of vegetative white can also occur in some of the sports, notably Elegans Splendor and Elegans Supreme. Chiswick House, London, England, Probable planting date 1830s. 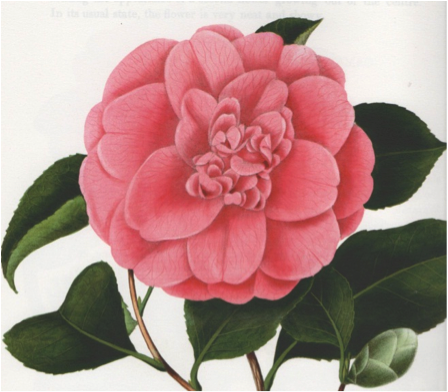 Records show purchases of camellias from Chandler & Buckingham, Vauxhall from 1828. Home at that time of the Duke of Devonshire. House and conservatory now owned by English Heritage, the park administered by Hounslow Council, with a Friends of Chiswick House Society giving invaluable support. Plant now restored to excellent health by the efforts of this Society and local ICS members. See ‘Rehabilitating the Chiswick House Camellias’, Jane Callander et al, ICS Journal, 1995, and ‘The Chiswick House Camellias’, Herbert Short, ICS Journal 1997.